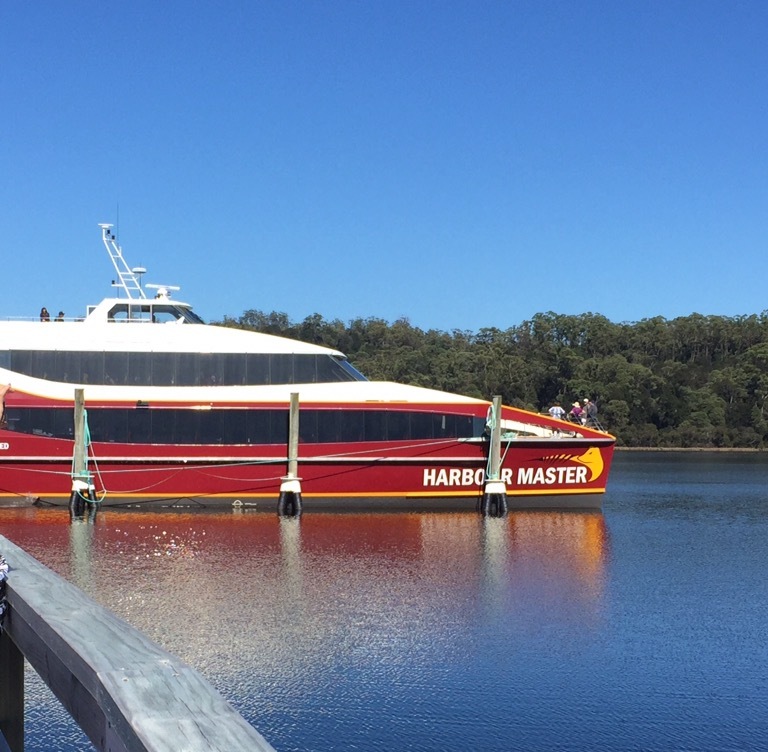 We were out and about early as we had to be at the harbour for 8.30 to catch the Harbour Master (the name of the boat) for our cruise out into the Macquarie Harbour and along the Gordon River. There were a number of people boarding the boat, some as lower deck passengers and others, like us, who had opted for upstairs with a free buffet lunch. It was a modern vessel with smartly dressed crew and catering staff. 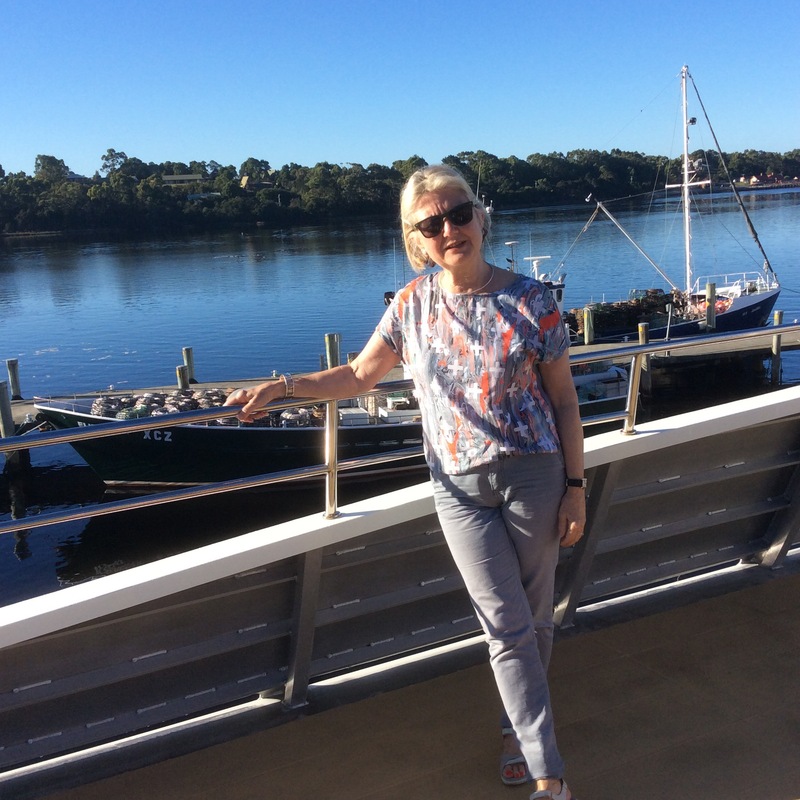 we settled down to business and descended from the top deck to get away from the sharp breeze that got up as Harbour Master (an odd name for a boat – as if they could not decide whether to call it after a person or an office……). I was equally concerned that after a short health and safety notice, we were invited to have coffee and ‘why not spoil yourselves with a dash of Baileys in it'(!!!) which sounded a little irresponsible to me at 9.00 o’clock in the morning….. however. 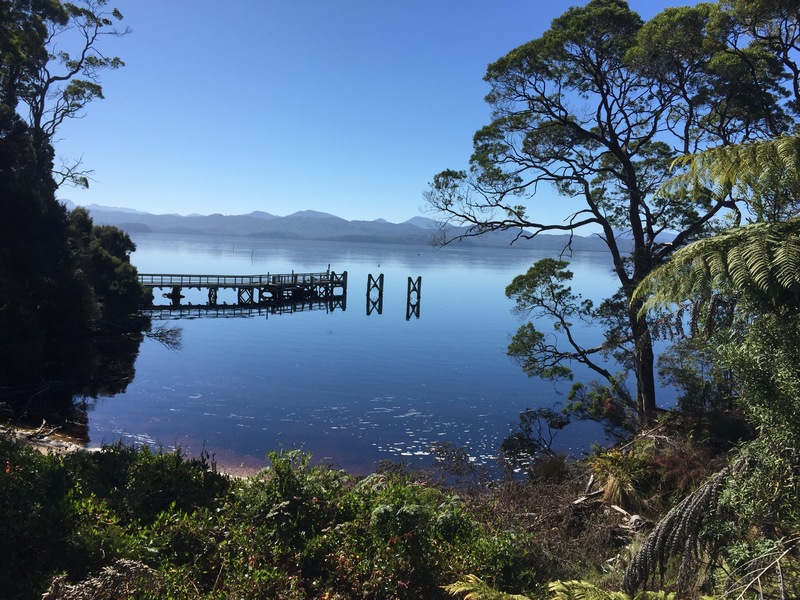 Macquarie Harbour is bigger than Sydney harbour. 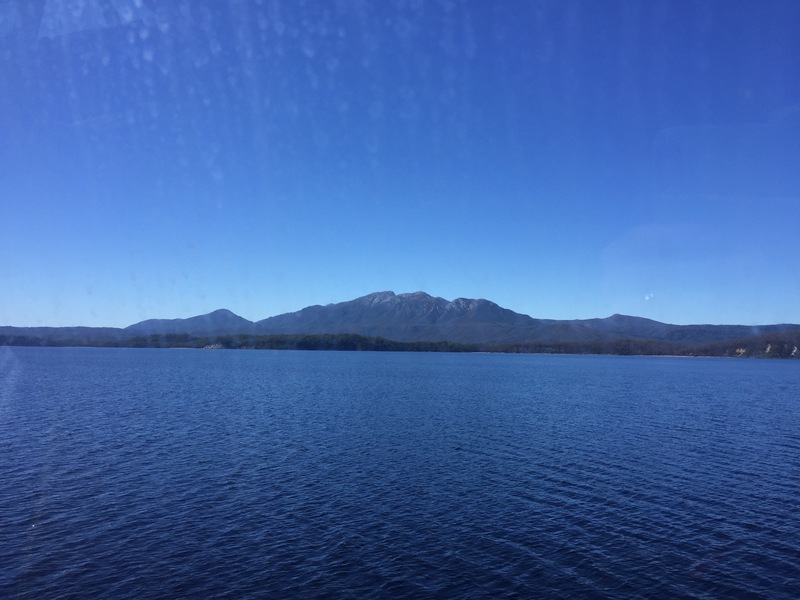 There used to be a passenger service between Strahan, Adelaide and Melbourne. 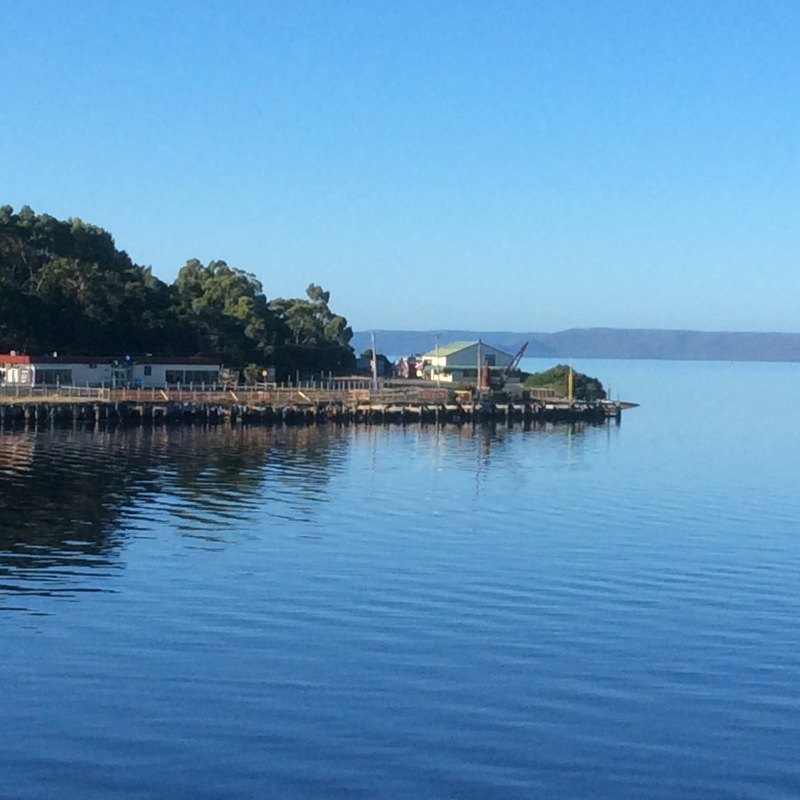 As a port Strahan developed as a place for shipping the minerals mined inland. It is now purely a fishing port. The prized abalone, that I personally find disgusting, is found in the waters. Anyway to get back to the tale. 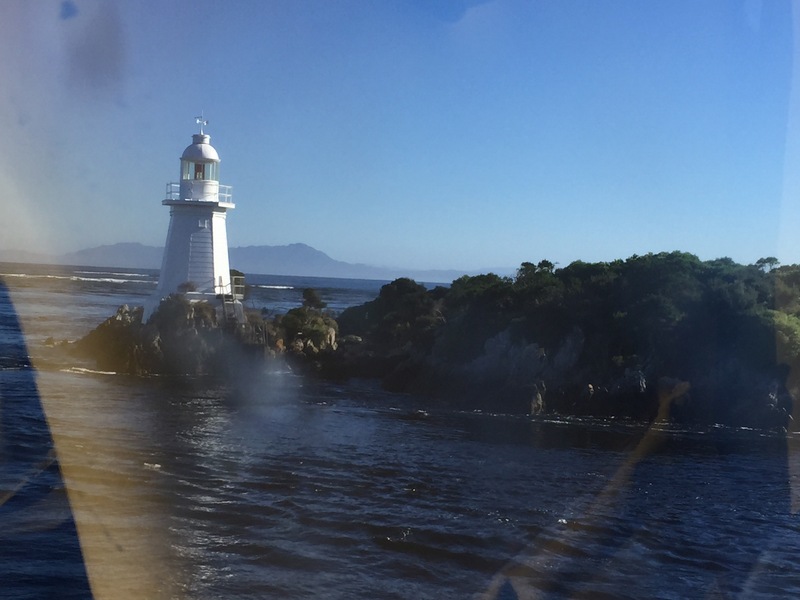 We first cruised out of the ‘gap’ and turned right along the coast. Here the initial sandy cliffs gave way to the long Ocean Beach which we had visited on our way into town, seen this time from the seaward side! 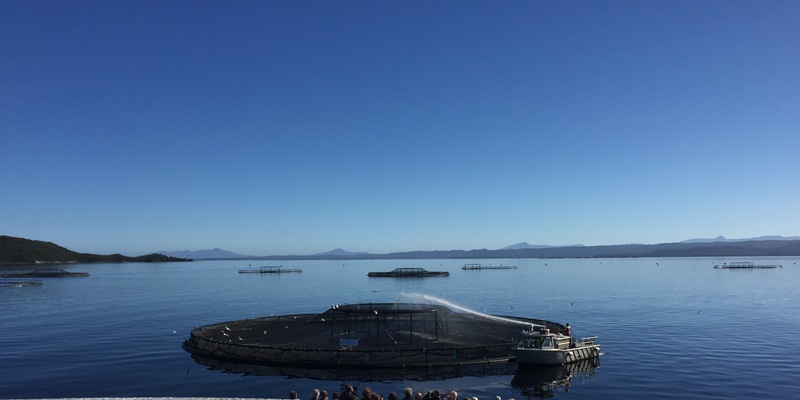 There are fish farms out in the bay. Mostly farming salmon, they provide jobs for the local community. There were huge cages holding up to 30,000 fish each. They grow to full size in 18 months when they are collected on barges. The biggest problems are caused by seals accessing the nets. From the practical issues of today we moved back to the issues of the 1800’s. 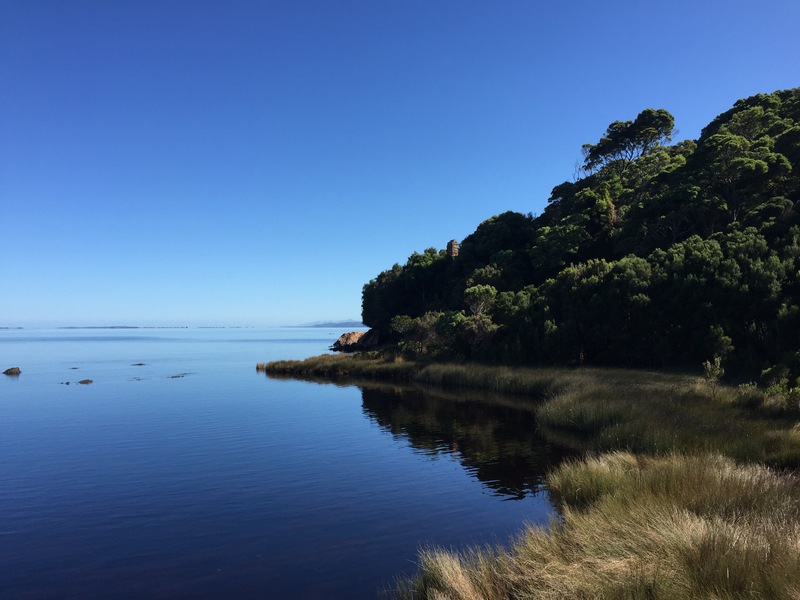 In 1815 Captain James Kelly became the first European to set foot on the now infamous Sarah Island within the harbour. (He named the island after the wife of the man who sponsored his trip – I bet she was thrilled given its reputation!) He had discovered the ideal location for a prison outpost. 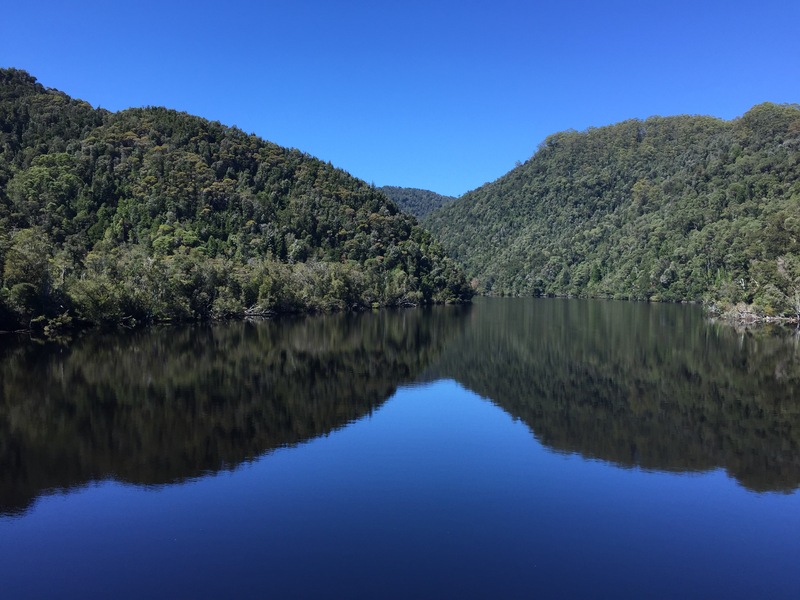 Remote, surrounded by water, the nearest land an impenetrable wilderness and with an abundance of Huon Pine and Celery Top timber – the wood that does not rot and ideal for making ships. 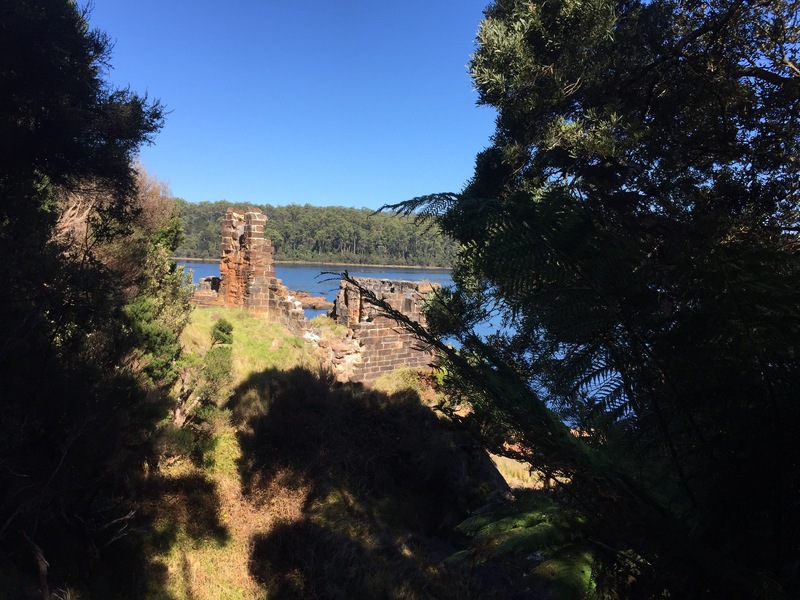 Established in 1822 the convict station known as Settlemnt Island promised the worst fate possible for a convict. It was the harshest of regimes. It was a place of dread and fear. 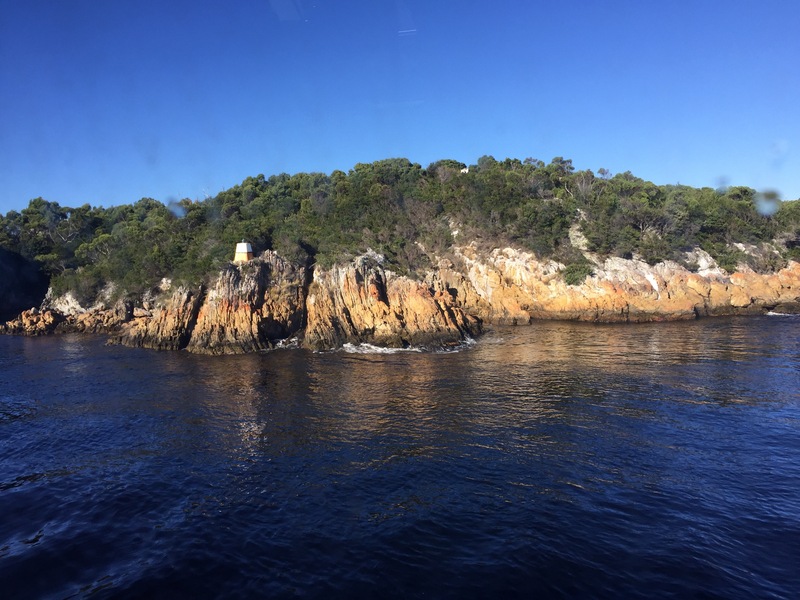 The entrance to Macquarie Harbour was called Hells Gate by those entering it en route to the Island. It was the repository for the convict who had been sent to Tasmania or Van Diemens Land and had then re offended. The convicts were treated as slaves. The first Commandent was described as a ‘sadistic bully with peculiar qualities’ (whatever that may mean!!). He authorised 9,100 lashes in his time with something called the ‘Macquarie Harbour Cat’ which was much heavier than that used by the army or navy for punishment then. The Goal had cells 6 ft by 3 ft – the size of a grave. In addution to the prisoners, there was a military presence, a missionary and his wife and a surgeon. A number of women lived on the island related to the military and officials. For them all it was a sentence. The wind around the island was so strong that a 12 m palisade had to be built to act as a buffer against it. The prisoners were initially employed felling trees in readiness for them to be shipped elsewhere, worked in the tannery, the blacksmiths or in the bakery. Later it was found that it was easier to make the ships on the island rather than fell trees and then prepare it for shipping and shipyards were built. Latterly the ships built on the island were the best of any built at that time. Life was so tough that there were many attempted escapes. Some were successful and some fatal. Many of the escapees were caught, tried and hanged, or died in the attempt. Whilst the life for convicts was grim and described as ‘unremitting depravity, degradation and woe’ the close proximity of all on such a small island (2 miles in circumfrance) meant that tensions were also prevalent amongst the officials and military. There are tales of mysterious deaths and requests to be relieved of duties. Today, with the sun shining, it is beautiful……. There is still evidence of the oven in which the bread was cooked ……. And what became the prisoners dormitory ….. But mostly all evidence of the harsh times are gone. 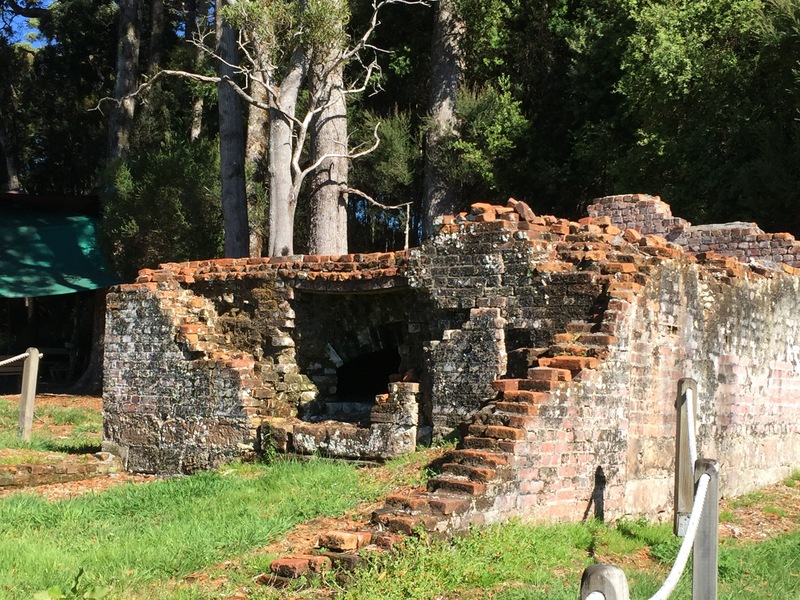 The odd fireplace, the exterior walls of the Goal, but for the most part it has disappeared and the horror of the prisoners who lived there has been eradicated. For us, after our tour of the island it was back on board for a bottle of champagne and lunch. 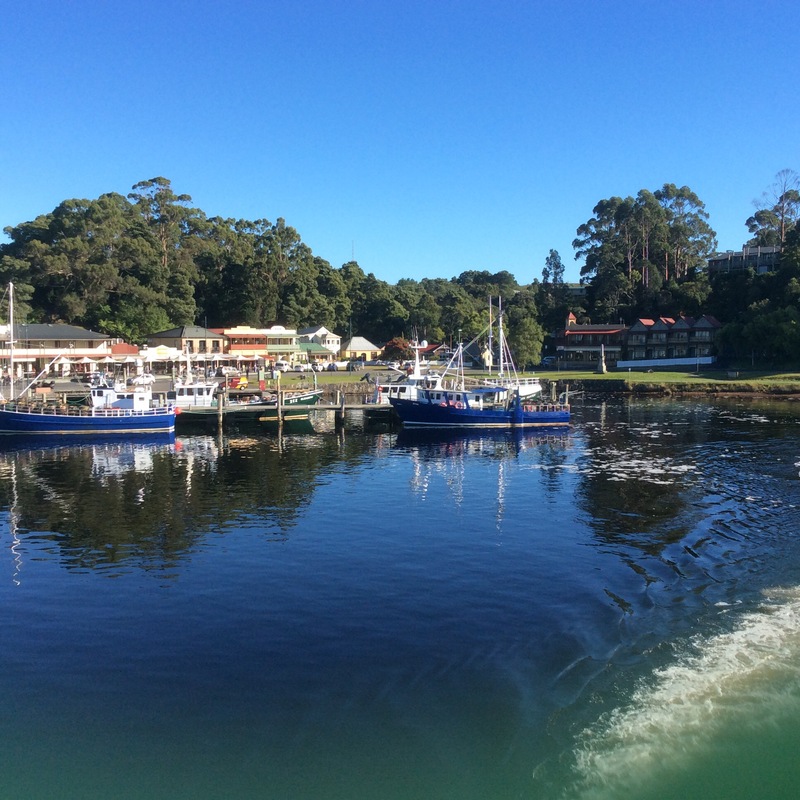 Our tour continued up the beautiful Gordon River and then back to Strahan. It had been a beautiful trip and one never to be forgotten. It was then home for a siesta and then another great supper. Tomorrow we head to Hobart! Could the ‘gap’ in harbour wall be the harbour mouth? Looks lovely whatever you call it.